I'm one of those people who grumps about xmas stuff starting too early...unless it's cosmetics. When I saw this on September 22nd, I wasn't complaining! I love all of the glitter, jewel-tones, and RED that xmas brings to...well...everything! 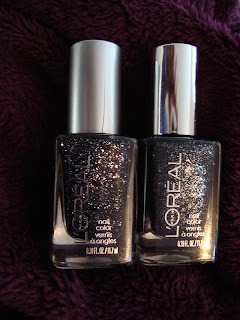 L'Oréal's Diamond Collection was my first holiday sighting this year, and so early. The Bigger, The Better instantly reminded me of The Queen's Ambition. "Reminded" is too soft a word...they looked almost the same at first. They're *completely* different on the nail. The Bigger, The Better is a bold mix of black and silver glitter and microglitter. I wore it over L'Oréal Notting Hill Blues, a gorgeous blue with a soft shimmer. This is just one thin coat of The Bigger, The Better!! Wow! It's dense enough that you could wear it on its own in a few coats, I'm sure! It applied really evenly too, impressive for such a dense glitter mix. It dries a little gritty, but a coat of Gelous and my usual topcoat were enough to completely smooth it out. They're both just so stunning! I'd tested The Bigger, The Better over a few other polishes, but it stands out best over this bold, bright blue. The tiny black microglitter is so cool, and the less-dense silver keeps it from looking flat. I adore the contrast! The matte top coat turns the tables, bringing the silver out over the black. It's a completely different look this way, silver glitter with a smoky backbeat...so versatile! ...ok...I gushed a bit here. Sparklicious was going to be part of this post too...oh well...next time! You should gets! And Sparklicious too!